Tony and his wife Cathy were invited by Vittorino Facciolla, the mayor of San Martino in Pensilis, a small village in Molise, to visit the region, receive the keys of the town (Cathy’s ancestors are from Molise), attend La Carrese, which is an oxen driven cart race that has been held every year for the last one thousand years (perhaps not) on April 30. Cherry on the cake: the local band will play during the celebrations and I know they are already working hard on The Star Spangled Banner – no kidding. Tony and Cathy accepted, and I am going with them. No, Obama is not going. Not this time. The whole thing started with another brilliant idea of Francesco Travaglini, the young man behind the Tratturello Olive Oil who sent the Bottle #1 of his new harvest to Obama. I am so excited! I have never been in Molise, and this is the perfect opportunity. Now, the feverish planning of the details: will Tony cook? I don’t think so. 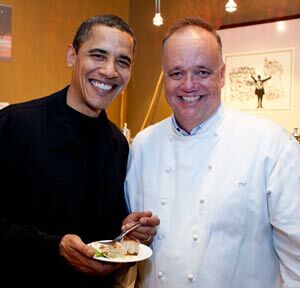 He is the great ambassador of Italian cuisine, culture and tradition to the most important man in the world, the President of the United States. Do you want him to work, too? No way! Previous Post Our Customers! Meet Casimiro.